Berwick-upon-Tweed, now an English town, changed from Scots to English and back thirteen times in the last 300 years. Three miles from the border with Scotland, Berwick had a violent past. The Border region once thrived on raids, and disorder was just a way of life. There were raids, pirates, sea battles and occasional truces. Anglo Saxons fought Vikings to the death here to protect their kingdoms from raiders. For centuries the County was the site of much bloodshed. Once, Berwick-upon-Tweed was one of Scotland’s most important ports. At the time of Edward I Berwick was the great merchant city of the North. It was also Scots. In the struggle for control between the two kingdoms Berwick, on the border, was almost destroyed. Edward I stormed Berwick, the citizens taunting the English King from behind their stockade. Almost 8,000 citizens were killed. A group of Flemish traders occupied the Town Hall and were burned alive, locked inside the Town Hall. Ruined Berwick sank from being the great merchant city of the North to being a work-a-day sea port. It finally fell into English hands in 1482 seized by Richard Duke of Gloucester. Nevertheless, Berwick’s football team is today the only side in England to play in the Scottish league. Two miles North West at nearby Ford, James IV destroyed a C14thcastle in 1496. In the reign of Henry VIII, James IV of Scotland invaded England as a gesture of solidarity with the French. Henry was abroad on campaign at the time, so Queen Catherine (Aragon) sent an army north to meet the Scots. The fighting was at Flodden Field. James IV of Scotland spent the night before the battle at Ford Castle, a C13th square built fortress with a tower at each corner. Three of the towers still remain. In 1513 they used modern weapons along with the old, so they fired cannons along with long bows! At the end of the day, James IV and many of his nobles lay dead. One of the most expensive building projects of Queen Elizabeth’s reign was the building of Berwick’s town walls. This cost was £128,000; Queen Bess spent the money to keep the Scots from entering. These are now the most intact Elizabethan town walls in England. Today, it is possible to walk the walls and enjoy views of the Tweed estuary and Berwick’s bridges. Robert Stevenson built the Royal Border Bridge, which is one of the finest of its kind in the world. 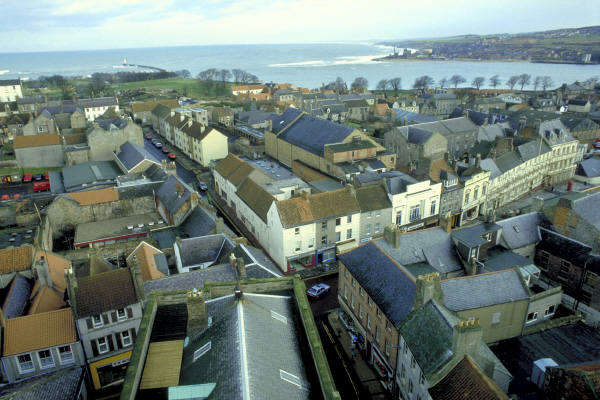 The town of Berwick-upon-Tweed in Northumberland ©www.visitnorthumberland.com. Berwick-upon-Tweed has Berwick Barracks and The Main Guard, two museums showing the town’s raging past. Visitors can also tour the town’s old court, jail lockups and drunks’ cell in Berwick Town Hall. The Town Hall was a Guildhall in the C18th. It had a steeple and a clock tower. A trap door in the tower was used to access the goal which was on the first floor. Prisoners waited in the goal in shackles for transportation to Botany Bay. The history is inescapable and fascinating here. But there is much of the present to welcome visitors. The town has three galleries: The Granary Gallery, Gymnasium Gallery and Watchtower Gallery. From 1935, the artist, L.S. Lowry, often came here; staying in the Castle Hotel. Today you can follow his steps on the 5 mile The Lowry Trail. Rachel Joyce, a bestselling novelist, set her latest book in Berwick-upon-Tweed, The Love Song of Miss Queenie Hennessy. Berwick has a range of annual festivals including: Film, Book, Music, Seaside, Walking and Food & Beer Festivals. The Maltings Theatre & Cinema has a varied programme through the year. In 2015 Berwick marked its 900-year story with events based on various aspects of the town, see Berwick 900 website. Berwick is a coastal town with four sandy beaches and beautiful riverside walks. It is perfect for a relaxing break and a haven for walkers, cyclists and families. My favourite memory of Berwick is stopping here for lunch on the way to a holiday on Lindisfarne. It was a bowl of mutton broth; never forgotten it. Pease Pudding is a local Northumberland delicacy not to be missed. It’s traditionally made by simmering a muslin bag of split peas in a ham broth until the peas are soft. Next time you’re up here, why not give it a try. 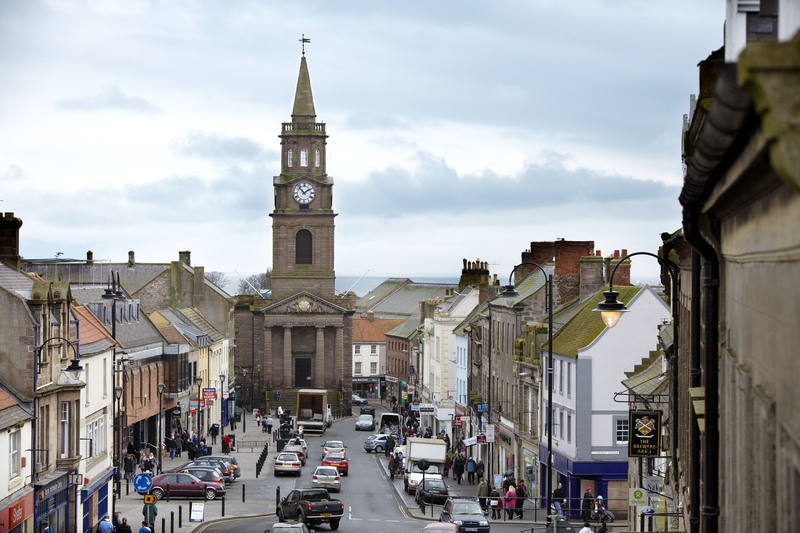 Please tell us what you like about Berwick-on-Tweed and Northumberland. Next PostKendal a green and beautiful town!